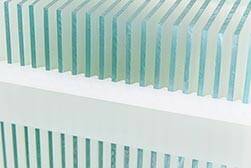 High-Density Polyethylene carrier tray for 10 cm glass plates. 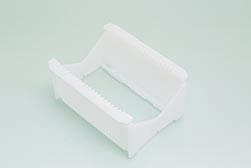 This carrier tray is ideal for the manipulation of 10 cm glass plates such as coated glasses and TCO substrates. The conical section of the grooves ensures that the surface of your plates is not touched by the carrier at any place. It can host 20 samples, up to 3 mm thick, with a confortable distance of 6 mm between each item. Made from high-density polyethylene, the carrier allows for bath treatment in aqueous solutions as well as in most common solvents, could it simply be substrate cleaning, or batch chemical treatment of your samples. 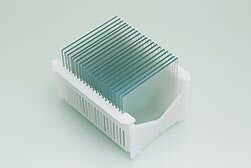 This carrier tray is also safe for sonication baths. The carrier tray is a great companion for sorting and handling your substrates while processing. For example during screen-printing, keep the tray upright so that the substrates remain horizontal to level out the fresh prints.